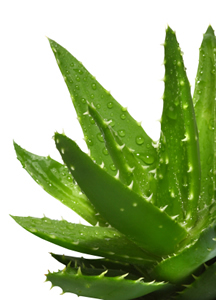 Aloe is a potent natural source of alpha-hydroxy acids that are found in pricey facial care products. The thick juice from a broken leaf of aloe is an excellent home beauty treatment to nourish the skin and diminish wrinkles -if you don't have aloe as a house plant use only the purest, highest quality aloe gel. Commercial aloe skin care products (containing stabilized aloe) do not have the power of fresh aloe because they no longer contain any tannins, and are mostly adulterated with alcohol.